Delhi is a city that one can say is feasible for time travel. As you enter the city, you would board the time machine, which would transport you to Old Delhi, where one would come across labourers carrying sacks of spices and simultaneously jewellers who weigh gold on scales. At New Delhi, you would come across the colonial parliament buildings and people with a liking for high tea. Delhi is the nation's capital and was regarded as a respectable and sensible city of bureaucrats. The city has a very long and vibrant history, from being conquered by the Mughals, colonised by the British and home to the refugees from the Partition of India and Pakistan after independence. Coming to recent times, a revolution was born with the rebuilding of ordinary neighbourhoods into cosmopolitan and beautiful destinations to explore. Here is a list of such places. Read on and decide where to go first. Connaught Place, fondly abbreviated as CP, is the central business district of New Delhi. The area was developed by the British in the year 1933. The place consists of three rings of colonnaded white Georgian-style buildings with a park at the centre. CP is considered as the heart of the city and is well connected by roads and the metro. Posh bars and restaurants are found in the area, which attract the party animals at night. Most of the restaurants and bars are in the outer circle, while the middle circle is home to banks and other commercial establishments. Some of the major attractions of the area are the serene Gurudwara Bangla Sahib, Prachin Hanuman Mandir, Janpath market, Devi Prasad Sadan Dhobi Ghat and the well-known Agrasen Ki Baoli. Hauz Khas is the answer to Delhi's hippie neighbourhood; the place is home to some interesting medieval history which dates back to the 13th century. Hauz Khaus in translation means royal water tank, which was built here from a reservoir, which is now encircled with a walking track and is a major attraction at the Hauz Khas Complex. The area is also home the ruins of a fort, a madrasa, a mosque and the tomb of Firuz Shah, who was a ruler of the Delhi Sultanate. Along with these is a deer park, which is very popular amongst the visitors here. The place was not very popular in the 1980s until it was redeveloped to a posh, commercial and residential area. At present, the urban village is filled with fancy boutiques, art galleries and much more. The urban and serene Sundar Nagar has been increasingly popular in recent times. This neighbourhood gets its name from Sundar Bawa Singh, who was the first individual to purchase a plot here after the government began to develop the area in the 1950s. The neighbourhood has a central location, which is squeezed between the historical monuments of Purana Qila in the north and Humayun's Tomb in the south; it also borders the Lutyens zone. The Sundar Nagar Market is one of the best markets in the city and is well known for its fine tea stores, art and antique shops along with several jewellery stores. The area is a must visit especially during Diwali when there is fair hosted at the Sundar Nagar Park. Located to the south of Sundar Nagar and east of Lodhi Colony is Nizamuddin, which is divided into east and west. The major attraction of Nizamuddin West is the dargah of Hazrat Nizamuddin. The dargah is well known for its live qawwalis, which are held here every Thursday evening, and for its religious values. It surely is worth going around the densely populated area, which is known as Nizamuddin Basti. On a contrary, the popular Nizamuddin East is a very posh and wealthy residential neighbourhood, which is home to quite a number of celebrities, politicians, journalists, etc. This part of the city was actually developed to house the refugees who fled from Pakistan during the partition. The refugees later sold their properties to wealthy individuals, who later built huge bungalows. Lodhi Colony began its transformation from 1940s as a residential areas for the government officials. Located in the clean and green Lutyens zone, it was the last residential area which was built by the British before they left India. Lodhi Colony holds the distinction of being the first public open-air district. 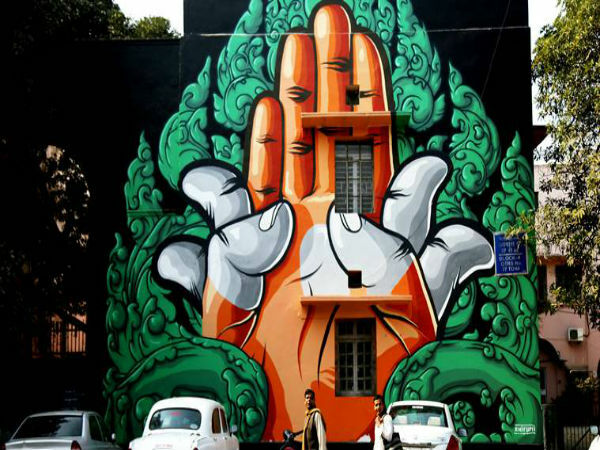 The St+art India Foundation brought in artists from across the country and the globe to paint murals on buildings between Khanna Market and Mehar Chand Market.